In the Islamic University of Technology Gazipur, Bangladesh (Organization of the Islamic Conference, OIC) Muslim students from different countries from different parts of the world reside together forming a Multicultural environment. During Ramadan the IUT campus is almost deserted, only the foreigners live in the whole campus. During my short stay in the campus I came across a number of African and Middle Eastern students who are staying back in the campus for Ramadan and Eid. We had a wonderful discussion about the way they celebrate Eid in their own country and their experience of Eid in Bangladesh. 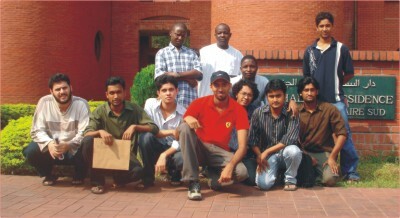 Among the student community students from Gambia, Nigeria, Palestine, Pakistan, Bangladesh and Jordan were present. We started our conversation with Omar Jabbi a student of Computer Science and Technology from Gambia who said that on Eid day they wear their best new cloth and go for the morning prayer with family members. They celebrate Eid for three days and each day has a charm of its own. In the evening the children fill up the streets and have party. They exchange Eid greetings with everyone and on that day people forget all their differences and celebrate Eid together. The conversation was interrupted by Abdur Rahman a student from the same department from Jordan, he added that the most exciting thing on Eid day is collecting Eidee from the elders. He said that Eid is observed in the similar way all over the Muslim World except for the food. He spends the Eid day with friends and families and play football. But when he is in Bangladesh he goes to the Palestinian embassy to enjoy the party. Since Jordan does not have any embassy in Dhaka he has to go to the Palestine embassy. At this stage of the conversation Aliyu Kanti a Nigerian student added that Eid is spent in a slightly different way in their country. IN the morning they slaughter cattle in the first day and distribute the meat with their neighbours. After the morning prayer they all go for the “Durba” horse race. This is a special event organized by they Aamir who is the leader of the community and is attended by the village head and other villagers. It is a very colourful festival with the horses decorated with gold. In the evening the children collect Hapisalaa ( Eidee) from their elders and arrange a party for them with the aggregated money. Party is arranged in the community where the timing is different for every age group of people. Omar Sadio from Senegal shared similar sort of experience about Eid with only difference of that they don't have any horse race but they start their day with a very special type of dish called “Kuskus” which happens to be similar to our Bangladeshi “Shemai”. They also observe Eid for three days with friends and families and exchange gifts among them. Md. Ahsan Nazir a Pakistani student and the IUT Alumni Association foreigners' representative added that in Pakistan Eid starts from the “Chand Raat” and continue for three days. In the morning they go for the morning prayer and exchange greetings with friends and family. In IUT most foreigner go to their respective embassy to celebrate Eid in their own way and enjoy their country's food. In the night a special dinner party is arranged by the Vice Chancellor of the University for all students. In IUT the foreigners live together like a family and as everything is closed in Dhaka on Eid day, they usually spend most of their time in the campus, watching movies and visiting different rooms in the hostel. They some time even prepare special foods or themselves. I found one thing common practice among all the Muslim countries and that is collecting Salaami or Eidee from the elders. So next time when your elders refuse to give you Eidee show them this article because it seems to be 'Faraj” in the Muslim World. On the Eid day, just after we wake up and some of us who follows Bangladesh in observing fasting will perform the Eid prayer in IUT's mosque, then we will have a special breakfast arranged by IUT, after that we go to our Embassy and celebrate it with our Ambassador. We enjoy a dinner together with the VC, and other staff of IUT on the campus. This becomes a routine for us every year. On the second day, some of us will go out to call on the Palestinian families and other friends and some will go visit some Bangladeshi friends and enjoy Eid with them.